Remember the incredible 3-ingredient dessert I posted sometime back? An easy version of Mishti Doi which is still one of my favourite desserts to make and eat, specially considering a prep time of under 5 minutes. So here's one more. Just two major ingredients that come together in under 20 minutes to create a delicious sweet that unmistakably reminds you of your local sweet shop back in India. A couple more added ingredients for flavour and appeal and you are dun duna dun done. I first came across this recipe on Sandeepa's blog when I was blog-hopping about 3 years back, and marvelled at how easy things could be, if you wanted them to. My husband loves Kalakand and he was the one who introduced it to me, soon after we got married. There was a sweet shop close to our place in Malleswaram, and whenever we would visit someone in B'lore we would drive a mile down the road, I would hop into this store and order a pound or two of Kalakand to go. So when I saw the recipe, trying it out sounded like fun. No kids or worries then, and I had nothing much to do anyway. So I went to the nearest Safeway and got some ricotta cheese, without having any idea what it was. Turned out to be our very own paneer with a creamy consistency packaged in a cool container. Really?? And all this while I thought 'cottage cheese' was paneer. (Cottage cheese doesn't taste anything like paneer, btw). I guess you could substitute crumbled paneer if ricotta isn't available, but I haven't tried. The experiment turned out fine and luckily for me, my microwave is on a table and not above the stove like you see in most kitchens here, so I did not have to stretch while stirring. If your microwave is on top, be careful while stirring or just use your oven-mitts to bring the vessel to the counter-top to mix it each time. 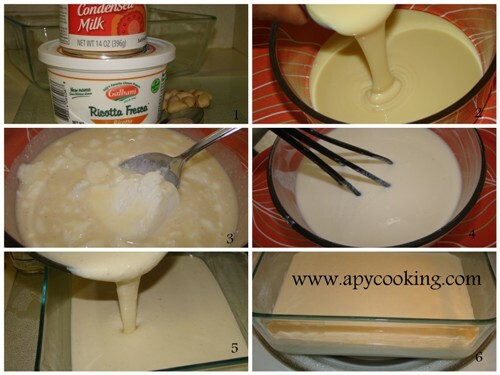 Recently a friend of mine, Keerthi, made this sweet using low-fat condensed milk and part-skim ricotta cheese (plus some milk powder) so if you want to feel less guilty, that works as well. In a large bowl empty out the can of condensed milk. 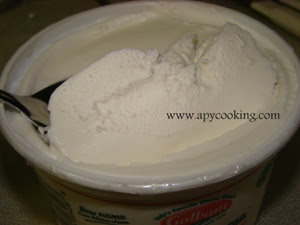 Add ricotta cheese little by little and mix well with a whisk. 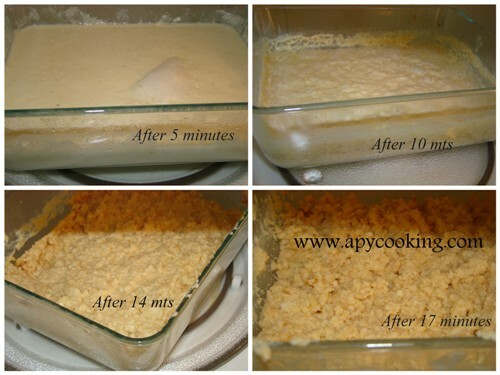 Lightly grease a large microwave safe dish [preferably rectagular] with ghee. Pour the mixture into this. Microwave for 5 minutes. Stir well. Microwave 5 more minutes. Stir well. Microwave 2 more minutes. Stir well. Microwave 1 more minute. Stir well. Microwave an additional 1 or 2 minutes, stirring after every minute. [So totally, microwave for 17 to 18 minutes. The time may vary depending on your microwave and the type of container you use]. The reason you keep stirring in between is that the sides can get burnt because of uneven heating in the microwave. Specially towards the end, stir every minute. The mixture should appear dry, but still have some moisture. 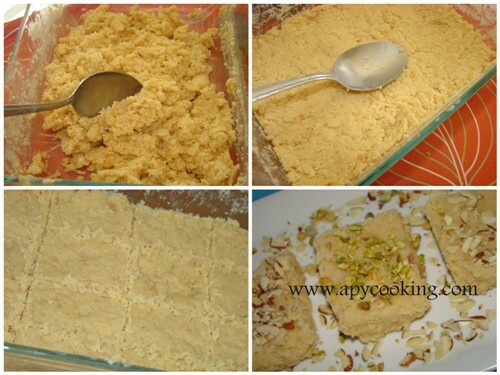 After removing from the microwave, sprinkle cardamom powder, mix well and spread the mixture across the dish. With the back of a spatula, press it down. Allow to cool for atleast half an hour. Cut into squares / rectangles/ diamonds [do not remove yet]. Leave aside for another 30 to 50 mts, till it sets well. Remove, transfer to a container and refrigerate. Before serving, sprinkle chopped nuts on top. Tastes great without nuts too! Easy to make, easy to transport, a great solution if you have to return someone's container (exactly the reason why I made it this time) - with Diwali not too far away, this sweet deserves a shot, what say!? This goes to bookmarked recipes. 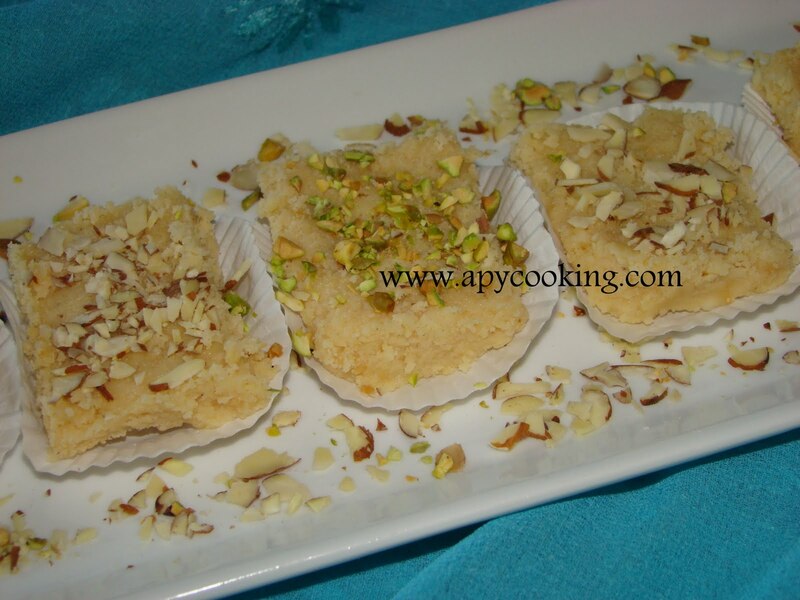 Mouthwatering and delicious looking kalakand dear. Would definitely try preparing it in this weekend. 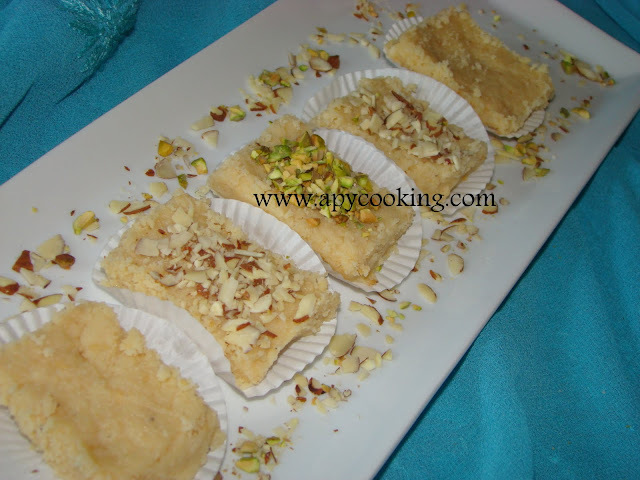 My fav anytime, feel like grabbin some..
Thats a quick kalakand recipe. Looks absolutely great. Wonderful sweet treat... perfect for the sweet tooth..:) Loved it.. I made this today and it turned out to be a huge success. My husband who doesn't like sweets loved it.